My main project right now is to transform my 52 Lists Project into something bigger having to do with inspiring, empowering, and encouraging women to share who they are with others and to take pride in all aspects of themselves. 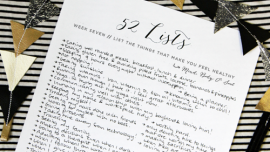 Right now, my 52 Lists project is a weekly project I post on my blog on Tuesdays which gives readers a prompt to create a List of something reflective, inspiring, confidence building, encouraging, or just a little fun. Each week I post my own response to the prompt, creating my list with intention and honesty. And I offer a free download for my readers to print out their own List pages week by week. I give my readers the opportunity to link up their posts about their lists so that we can all share as a community in our own self and communal discovery and purposeful investment. I want to figure out how to bridge this project into something bigger, perhaps creating an online course, a PDF book, or a tactile paper book. I care deeply about helping women to heal their wounds through thoughtful meditation on their experiences and through building up their goals and dreams. And what feels most important to me is to make sure we all build up a communal experience so we can help one another better. My name is Moorea Seal and I have so many goals and dreams that I am excited to pursue. Check out my GoMighty page here! I am a jewelry designer, blogger, and online curator. I love art, craft, beauty, and design. And most importantly, I care about encouraging, inspiring, and empowering women to love themselves fully and to pursue a compassionate life. My biggest goal in my life is to impact women’s life in such a way that every woman and girl in the world comes to understand how valuable, beautiful, and powerful she is despite any sort of trauma she may have been through. Through openness and understanding, compassion and care, I believe that women have an incredible power inside of them because of their own personal story to bring healing and peace to those around them. I believe in a universal women’s story, a community of women who recognize the pains of their lives and use their stories for good. I believe every woman has the opportunity to seek personal healing through loving others better, being open with their experiences, and through this they can bring inspiration and empowerment to others. My jewelry business is on the smaller side right now, but I have been able to use it as a beacon of hope to other women who seek to create a business or start a big project for their own self fulfillment. I use my blog as a source of honesty and inspiration for others. And someday I hope to spread my message of empowerment and compassion through what I create and how I speak on an even greater level. I want to be a source of hope and a beacon of love. And with everything I do, I hope it creates a flowering effect where those I effect go out and do great things for their own communities. I'm very open to advice so let me know if you have any creative ideas!